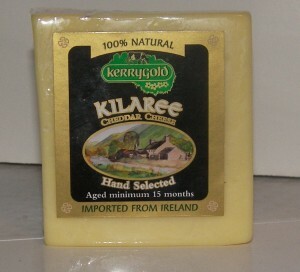 Have you bought yourself some Kerrygold Kilaree Cheddar Cheese and wondered what it would be good for? (besides just slicing and eating, which is good in itself) I think a classic baked macaroni & cheese dish would be a great use of this cheese. If you haven’t bough this cheese before maybe this is a good reason to go out and get it. The following recipe is NOT an official Kerrygold recipe. This is a recipe I have been using for years and I thought this cheese would work well with it. Preheat the oven to 350 degrees. Pour about a gallon of water into a large pot with a couple heavy pinches of kosher salt. Pasta should always be cooked in a large pot that has been heavily salted. Bring to a boil. When the water comes to a boil, dump in the pasta and cook until it is almost al dente, but still a little bit chewy, so it will be perfect when it comes out of the oven. Drain the pasta in a colander and place into your favorite baking dish. Here are your direction for making the cheese sauce. In a large saucepan, melt the butter over low heat. When the butter is completely melted whisk in the flour, black pepper, mustard powder, and a pinch of kosher salt. When the flour is fully incorporated, pour in the milk. Turn your burner to medium, stir often, until the mixture comes to a boil. Let the mixture boil for 1 minute, stirring constantly. Now slowly pour in the shredded Kilaree cheddar and whisk to combine. Pour the sauce over the pasta, mix to combine. Now place the entire thing into your oven and bake for 25 minutes. This will allow the cheese to thicken and brown. Browning the cheese will bring more flavor to the dish. Remove from the oven, let cool for at least 5 minutes and enjoy! Previous Post: « FAQ : Where Can You Buy Kerrygold Products in Michigan? This recipe looks delicious! May we post it on our Kerrygold Facebook page? Thanks, you may certainly post the recipe on the Kerrygold facebook page.